Tuesday Tip: Learn from the the best. 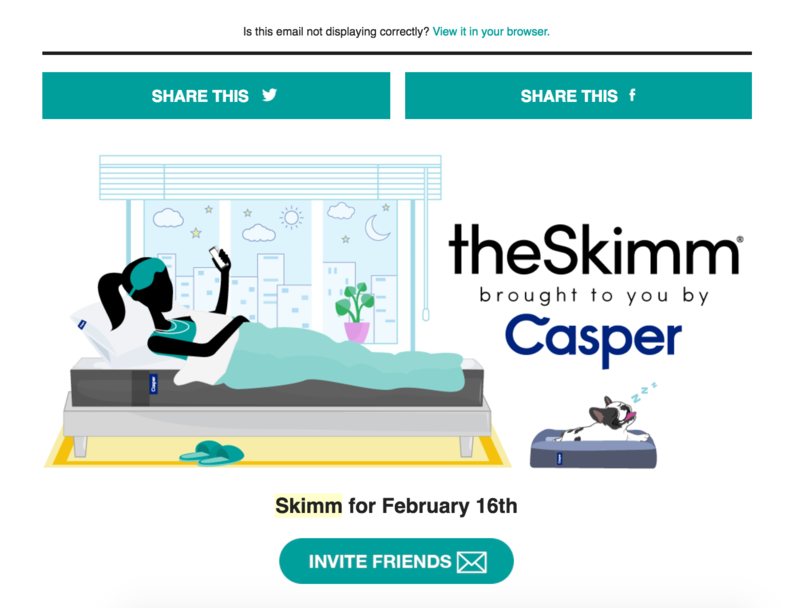 Targeted email marketing lessons from theSkimm. Whenever I mention theSkimm to friends or coworkers who also receive it, I get a similar response. Something along the lines of, "I always check that email - I love it!" or "now I actually read the news!" Wouldn't you love if people said that about your email newsletter? Well, there's no reason they shouldn't. Today's tip: Create a more targeted email marketing newsletter. Our case study: theSkimm. 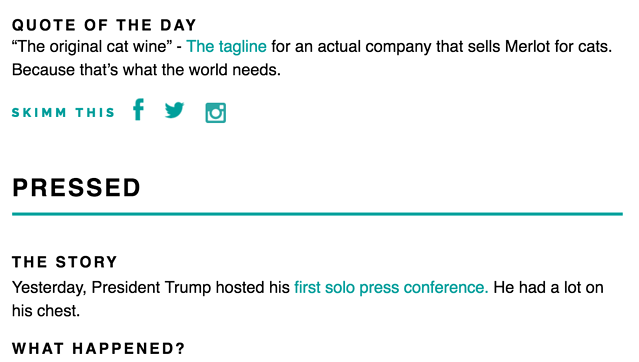 If you haven't already subscribed to the newsletter, the basic premise of theSkimm is that the writers recap on the daily news each weekday, so their readers can save time and simply skim the latest. Their motto explains it concisely: "theSkimm makes it easier to be smarter." Check out an example to get a better idea. 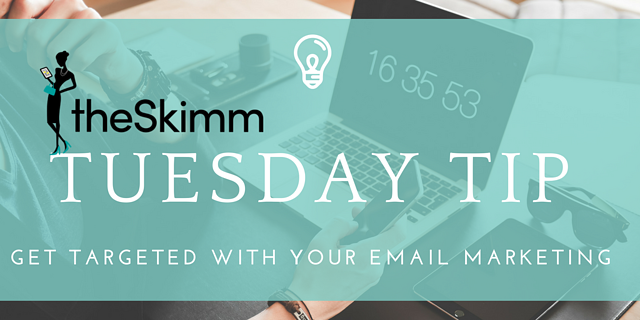 So what can you learn about email marketing from theSkimm? Let's break it down. The basics: TheSkimm may have a huge following now, but it didn't start that way. Here's my assessment of what they did right and what you could try for your email marketing strategy, no matter where your starting point. Out of all the reasons theSkimm is a successful email newsletter, perhaps the biggest is their understanding of their audience. This was essentially the focus from the beginning as two young, urban, female producers figured out their goals and positioning. They had friends who'd come to them for a recap of the news, as they hadn't had the time to digest it all themselves. From there, the two women wrote entertaining recaps to make the news more accessible. In a sense, their 20-something friends became their main audience persona. Ask yourself, are you trying to reach everyone from everywhere with your messaging? If so, think about your company's mission and instead, consider speaking only to who this mission serves. You'll be most familiar with this audience, so this will actually make things easier. If you have multiple target audiences, consider segmenting them into multiple email marketing lists. TheSkimm doesn't just know who they're talking to, they've figured out how they should talk to them. The messaging is funny and clever, giving the reader the sense they are listening to their friends summarize the news. The writers reference pop culture and almost make it sound like they have inside jokes with their audience. If you've discovered your audience, you can go on to study how they interact online. What type of messaging do they prefer? What sort of tone can you establish so it almost sounds like you're directly conversing with them? Remember your messaging doesn't have to resonate with everyone. It just has to work for your audience. Often times, we run into clients who have struggled to keep up with so many digital platforms. Their newsletter isn't performing very well, but they've run out of time to improve it as they try to keep up with five different social media platforms. TheSkimm's main focus is email, as they realized their audience would like a daily news summary sent straight to their inbox. They've added blog posts and some larger guides that focus on certain popular topics as there are some stories that need more than just a quick recap; for example, they covered the presidential inauguration. Now that they've built up their following, they have an app, a paid and advanced version of their offerings. When you see how much this organization has grown, it's easy to be discouraged thinking you'll never gather a following that wants to pay for your email. However, remember it only started as an email because they knew their audience would want it. Keep listening to that need and then deliver. Memory consolidation: Happens when you’re in a deep sleep. It’s when your brain takes your short term memories and files them away into the long term folder. That’s why it’s a good idea to hit the sheets early in the night before a big presentation. Want to upgrade your bedroom game? This mattress and this pillow are it. PS…we got you a little discount on the mattress." What's more, they deliver the same layout and visual treatments with each email, which can be a comfort each morning. Find the format and tone your audience likes by a/b testing your newsletters over the next few months. Once you find something that works, use that as your guide for each subsequent piece of content. From there, make smaller and less noticeable tweaks so you build on what your audiences wants. *Sidenote: When you've really built your brand, you can start using your organization's name as a verb. TheSkimm calls their readers "skimmers" and builds off of that for anything they name. More advanced: The first four points I made above are pretty entry-level; any email marketer can try them out. As you build your email newsletter, the next three steps can come into play. Once theSkimm had established its following, the next growth spurt came with Skimm'bassadors. Seeing as their a successful organization, people wanted to be a part of it and help it to grow. They offer rewards for these folks such as networking opportunities, featuring them in posts, and a toolkit to help them thrive in their role. Can you incentivize your audience to share your content? Think about how you can help them and they'll likely want to help you. You don't want to jump into humorous headlines before you know your audience. But once you have established who you're talking to and towards what they gravitate, you'll be able to have a friendlier tone. Some of my favorite such subject lines? "Daily Skimm: Break it down now" or "Daily Skimm: Did I stumble into some bad lighting?" If you find that your click-through rates go down when you get too sarcastic or too descriptive, keep revisiting your strategy. Above all, don't just guess what will excite your audience. TheSkimm has done several of these. One that got me clicking through on their emails was a drawing. You could win money if you opened their newsletter several days in a row. At the bottom of the email they showed you how many days in a row you had opened their newsletter. To me it felt like a challenge to stay educated on the news. They also recently set up a program to get people to share their newsletter. If your friend uses your unique URL to subscribe to the emails, you get credit. 10 subscribes like this and you are recognized as a Skimm'bassador. In the end, the most successful email marketing efforts come from organizations that ask themselves the right questions. What will get your readers excited about reading your newsletter each time you send it? What messaging works for them? What format? Above all, how will you help them? Interested in theSkimm after all this talk? You can subscribe here. If not, be sure to subscribe to our Tuesday Tip below!